This was originally written on my FB page where I post pictures and links almost daily and which you immediately should follow. 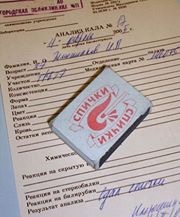 I remembered about the stool samples when I was writing this post about the Soviet medicine of my day. *Warning: please don’t eat while reading this. Soviet kids had to be healthy whether they wanted it or not. And healthy meant parasite-free. So once in a while, my school (and I imagine all the other schools in the area) put out a call for stool samples. By a certain deadline every child had to submit a matchbox full of you-know-what, tightly wrapped and marked with the name of a producer. At that time (and maybe still) the Soviet toilets (in places with indoor plumbing but not in public restrooms) were different from the American model we are all used to. Instead of a small pool of water ready to accept your deposits, it was more like a vase with hardly any water at all. When done, a person would pull a chain and a waterfall coming down from the high-mounted tank (if the water was on that day) would flush the stuff down through the hole located in the front part of the toilet. That technical aside was necessary to explain that at least our parents didn’t have to fish for floating crap, it was all right there, nice and piled. Clearly no 8- or 9- or even 12-year-old wants to have anything to do with putting their own crap in a small box, so that somber duty had to be fulfilled by our parents. Many years later, as a parent myself, I’ve done many disgusting things and touched some substances that would make a grown man gag (and they did). But even after thousands of diapers changed I am still not sure I could go ahead and do what my mom had to do. This is something that would make you think twice about having a child. I always imagined that a lab in lower circles of socialized healthcare hell, populated by medical school dropouts, dimly lit and smelling worse than a meatpacking plant on a summer day, did nothing else but unwrapped the packages and examined the contents for parasite eggs and the signs of dinners past.But in reality I think they just threw these boxes away and faked the results. After all, sooner or later the parasites show their ugly heads, if you know what I mean. Epilogue: When we came to the United States we had to pass some medical tests (in addition to the overpriced testing we were required to do in Moscow before we left). Then we received a mail-in stool sample kit, which consisted of some Popsicle sticks and cardboard envelopes. I was tempted to send my stuff in a box, but reconsidered and just threw the kits away. They would have to pry a stool sample out of my……….